Tip: How to detect small peptide clearly and sensitively by Western blotting or SDS-PAGE? Disulfide bonds are an integral component of the three-dimensional structure of many proteins. These covalent bonds are found in almost all classes of extracellular peptides and proteins. A disulfide bridge is created when a sulfur atom from one cysteine forms a single covalent bond with another sulfur atom from a second cysteine residue located in a different part of the protein. These bridges help to stabilize proteins, particularly those secreted from cells. 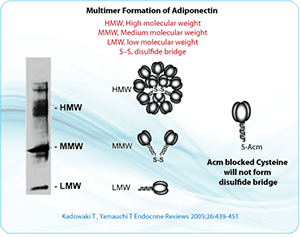 The artificial formation of disulfide bridges requires the proper management of cysteine residues, including first protecting and then later removing side groups and properly pairing the cysteine residues. This is the most frequently used method for peptide cyclization. Disulfides in proteins play an important role in the maintenance of biological activity and conformational stability. In chemical synthesis, the folding and disulfide formation of the fully unprotected amino acids in an aqueous solution by a mild oxidization to form the target product with the correct disulfide bonds. Air oxidation in aqueous medium. It requires a long duration in basic or neutral pH and a dilution of a peptide. The method is satisfactory for most acidic peptides. Powerful oxidizing agents for peptides with a single disulfide bond. Mild oxidizing agents for basic and hydrophobic peptides that tend to aggregate and precipitate out of the solutions during the folding process. 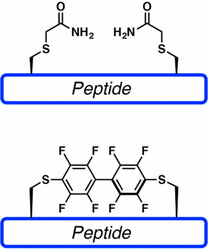 Perfluoroarene-based peptide macrocycles: This stapling modification performed on a peptide sequence showed enhancement in binding, cell permeability, and proteolytic stability properties, as compared to the unstapled analog. An oxidizing agent was used for the disulfide formation. The purified and reduced peptides were dissolved at pH3-8 with the oxidizing agent. The optimal pH range for disulfide formation is between 3 and 8. The protein denaturation may occur if the pH is lower than 3. The disulfide interchange is too fast at pH higher than 8. The oxidation reaction is usually 1-4hours and monitored by analytical HPLC. The human defensin peptide was successfully synthesized. Defensins are cysteinyl rich, cationic and antimicrobial peptides. Disulfide Bridges: LifeTein offers the formation of cyclic peptides via disulfide bridges between cysteine residues within the peptide. We can synthesize peptides containing up to 3 disulfide bonds by employing LifeTein's PeptideSynTM technology. Amide Cyclization: Depending on its functional groups, a peptide can be cyclized in four different ways: head-to-tail (C-terminus to N-terminus), head-to-side chain, side chain-to-tail, or side-chain-to-side-chain. LifeTein has gained extensive experience in synthesizing these challenging cyclic peptides. Disulfide bond formation is straightforward in peptides with one pair of cysteine residues. The peptide is simply synthesized via solid or solution phase synthesis, and the solution is then oxidized at pH 8–9. Synthesizing peptides that contain two or more pairs of disulfide bonds is more complex. Although disulfide bridges are normally formed toward the end of peptide synthesis, it can be advantageous to couple or elongate chains that include a pre-formed disulfide bond. The most widely used groups to protect cysteine residues are Bzl, Acm, tBu, Mob, and TMTr. S-acetomidomethyl (Acm) is a valuable compound because it is stable in both acidic and basic environments. It is also compatible with both Boc- and Fmoc-based methods. Some conserved cysteines within proteins are critical for protein-protein interactions. Disulfide bond formation can be prevented by modifying the cysteines using Acm, or by replacing cysteine residues with alanine. Modification of the cysteine using Acm blocks disulfide bond formation, but retains the cysteine and preserves the primary structure of the protein. To produce a free sulfhydryl group after the above method, S-Acm can be removed using solutions such as mercuric acetate (Hg[OAc]2,) in a pH-4.0 buffer for 1 hour. In addition, S-Acm-blocked peptides could be treated for 1 hour using silver trifluoromethanesulfonate in the presence of anisole and with TFA as a solvent. S-Acm can also be removed during the solid-phase synthesis step, when the peptide is anchored to the support, using 0.06M Hg(OAc)2 in DMF for 3 h in the dark followed by washing in DMF and DMF-beta-mercaptoethanol (9:1, v/v) to remove Hg2+ from the peptide-resin. 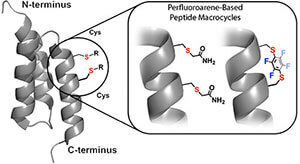 Perfluoroarene-Based peptide macrocycles contain rigid perfluoroaromatic staples. This method is selective towards cysteines and provides staples featuring lipophilic perfluorinated moieties. Why is Cysteine so Special? Cysteine has a very reactive sulfhydryl group on its side chain, from which a hydrogen atom can be replaced easily with groups such as radicals, which facilitates covalent bond formation with other molecules. Disulfide bonds are critical for the three-dimensional structure of several proteins. They reduce the flexibility of peptides, increase rigidity, and decrease the number of possible conformations: this is important for both structural stability and biological activity. As such removing a disulfide bond alters the overall structure of a protein dramatically. Hydrophobic amino acids, such as Leu, Ile, and Val, are helix stabilizers. Cysteines that are not involved in disulfide bridges could also enhance the stability of alpha-helices. It is possible that several cysteines in their reduced-form (-SH, free sulfhydryl groups) within an individual peptide could increase the density of helical fragments. Disulfide bridges between cysteine residues permanently stabilize the tertiary structure of proteins. Generally, disulfide bridges between chains are required for the quaternary structure of a protein. The cysteine residues that form S-S bridges can be located distant from one another in the primary protein structure. The topology of S-S bridges can be analyzed according to the primary structure of a protein. Generally, the position of cysteine residues in related proteins tends to be highly conserved; only tryptophan residues are conserved more than cysteine. Cysteine is located in the center of the catalytic site of thiol enzymes. It plays a direct role in the formation of acyl intermediate from the substrate. The reduced form functions as a sulfhydryl buffer to maintain the cysteine residues within proteins in their reduced state. At low pH, the reduced form (-SH) is preferred. Conversely, the basic conditions cause the -SH group to be oxidized more readily and replaced with -SR, where R is anything except hydrogen. Cysteine also detoxifies hydrogen peroxide and organic peroxides by interacting with them directly. Cyclic peptides are more stable against chemical- or enzyme-based degradation. The majority of enzyme-based degradation pathways are initiated via either the N- or C-terminus of peptides. However, cyclic peptides have no termini; therefore, they are degraded by peptidases to a much lesser extent than are linear peptides. Studies revealed that cyclic peptides exhibit enhanced cell permeability, as well as increased bioavailability, activity, and binding specificity. Structures that are restrained conformationally do not possess the flexibility that is observed with linear peptides, which reduces their binding to non-target molecules and increases their activity toward the specific target. Stability of linear vs. cyclic RGD peptides. Cyclic peptides are useful in applications including by exerting antimicrobial, anticancer, or other biological activities. Exopeptidases digest peptides starting from the termini; therefore, cyclic peptides are highly stable exopeptidases cannot break them down. Because cyclization exerts constraints on cyclic peptides, they exhibit different conformational preferences compared with linear peptides. In linear peptides, the peptide groups are found far more commonly in the trans conformation. In contrast, cis isomers become more stable with a decreasing ring size in cyclic peptides: cyclic di- and tripeptides prefer all-cis conformations. Many cyclic peptides utilize S-S bond formation within their structure to enhance the rigidity of their conformation. This allows both receptor selectivity and increased potency. Cyclc peptides exhibit improved biological activities compared with their open-chain counterparts because their structure is more rigid. We routinely prepare cyclic peptides using head-to-tail ring closure, and commonly achieve directed and complete Cys-Cys disulfide cyclization by monitoring the reaction carefully. Arg-Gly-Asp (RGD) peptides contain aspartic acid, which is highly susceptible to chemical degradation and the resulting loss of biological activity. Previous studies compared the solution stability of a linear and cyclic RGD peptides (Arg-Gly-Asp-Phe-OH, and cyclo-(1, 6)-Ac-Cys-Arg-Gly-Asp-Phe-Pen-NH2, respectively) in buffers of varying pHs and concentrations. The cyclic peptide was 30-fold more stable compared with the linear peptide at pH 7. The linear and cyclic peptides are both degraded via their aspartic acid residue. The increased stability of the cyclic peptide, particularly at neutral pH, could be explained by the increased rigidity of the ring, which prevents the Asp side chain carboxylic acid from being orientated in a position that allows degradation of hte peptide backbone. Reference: Solution stability of linear vs. cyclic RGD peptides. J Pept Res. 1999 May; 53(5):530-41. 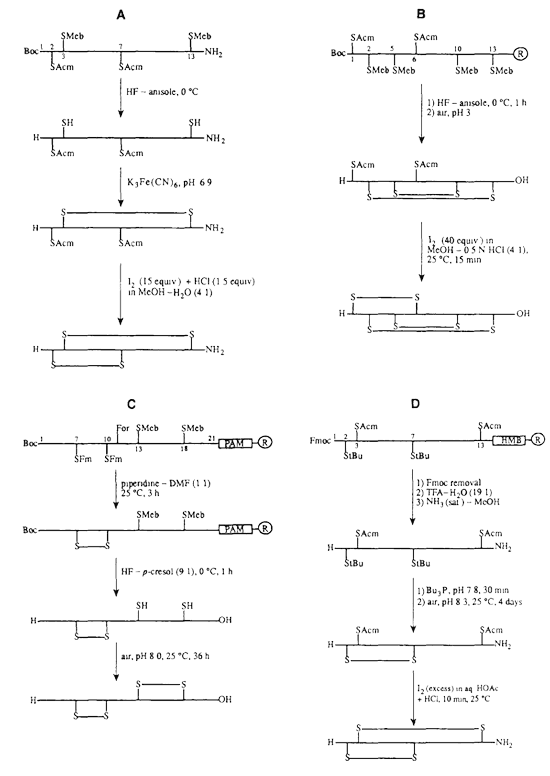 Multiple disulfide bond formation schemes. Method 2: Please complete the Quotation Form for the peptide you would like to purchase and either fax it to 1-888-791-1618 or email it to peptide@lifetein.com. We will send you a quote within 24 hours.